He's at a bacteria filled beach. Bad choice of vacation locations, Dave. Dave, you ARE in Minnesota! Why the heck are you in Duluth? Enjoying the algae blooms in their full glory, perhaps? The bacteria-wading is really overrated, take my word. Greetings from sunny Minneapolis, good sir! What does one do in Duluth? 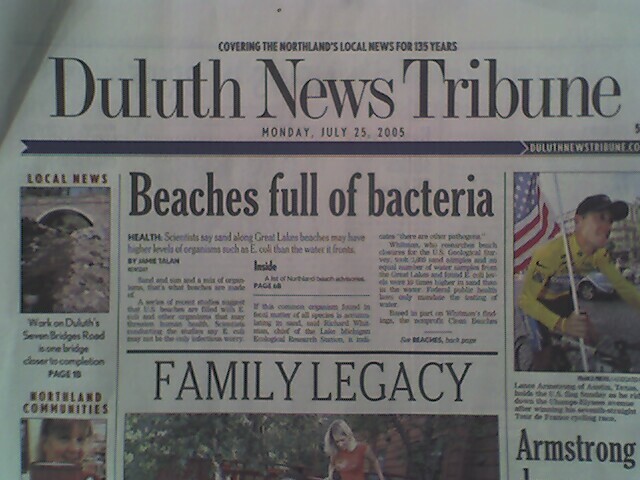 But, "Bacteria Filled Beach" WBAGNFARB. What, is Cher reprising her Farewell Tour stop in Duluth? And the CrapCam couldn't get a better shot of that potentially cute blond in the picture? At least there's bacteria involved. That always makes things better. In the Family Legacy article. Not Lance Armstrong. NTTAWWT. I've got it! He's in Topeka! are you on a speaking tour of the upper midwest mayhap? even tho its hot out there, its a much better idea to visit duluth -- if you must visit there -- in july than january. what the heck? it's like i entered the twilight zone. jamie, could be worse. Your Twilight Zone could be in Duluth! I'd ask Dave to come visit me down here in southeast Minnesota, but I've made the drive from here to Duluth, and it's five hours of hell. Oh, well. jamie - happy birthday. May the Force be with you. jamie - brilliant brithday trick! Obviously the force is with you - Happy Birthday! And also Happy Birthday to queensbee who told us her b-day was Saturday! Being that you're a star wars fan and can type, I'm guessing 13, or so. Dave, make sure you take the drive up the coast of Lake Superior, it is gorgeous, but even better in the first week of Oct. Temperance River was where we always camped, when I was younger. Nice rocky beach. Prolly full of GenXers now. Make sure you've got plenty of mosquito repellant. They are classed as Birds in MN!! Beware of inland, though; lots of Paranoids hole up in Cabins up there. Unless they're on lake Superior. Then, they are Millionaires. After that many years, we've learned to sensationalize the trivial and the obvious.
. . . also, water . . .
.. what you do in Duluth??? Say hello to my Psychotic pt.s walking the strets there.. but don't mention my name!!! Are there Minnesota mollusks in that lake? Then instaed of CRAPCAM it should be CLAMCRAP. Nice Fed. She lost her parents in an accident, and you're hitting on her. Maybe next summer, they could make a movie about you: The Funeral Crashers. FWIW, my guess was that she was log rolling. There is no way Dave is in Topeka because, trust me, NOTHING funny has happened here in years. Well, there was that incident when a rotten tree next to city hall leaped to it's death atop an old Buick. While the story had potential, it "ahem" fell flat when the city refused to reimburse the newly carless gentleman. Relied on the old "Act of God" dodge. While it's true that Buicks are pretty darned ugly, this is the only one in recorded history that God actually flailed with a whole tree. I know you probably have heard "scare stories" about agent orange. Well, they're true. Nevertheless, it's the only thing that can save you from the mosquitoes and horseflies that will carry you off to their lair if you go outside in Duluth in July. Hey Dave are you up there trying to get Prince to play on the next Remainders Tour? Cool... Drink alot of Lienekugels or what ever the name is of that beer from up there , eh ? That 'll keep the mosquito's away ..Not..
What about the blone and what IS she looking at? Fed, it looks like you have yourself a co-star! Morty, you could win best supporting actress for The Funeral Crashers next year. You should take your agent to a nice dinner tonight. He deserves it. I'm guessing New Jersey. Am I right? Hello from Rochester, MN. We have an OK beach down here if you don't mind swimming next to a playground dedicated to the memories of all the children who drowned at that beach. THEN, get your Leinie's in Canal Park, but WATCH OUT FOR THE LOONIES! Duluth, Duluth, Duluth is on fire. We don't need no water let the MF burn. I almost feel bad about this (almost), but hey, Gretchen is an 18 year old blonde ex-softball player who's entering Hamline University in St. Paul soon. And apparently a log-roller as well. She's been doing her own laundry and grocery shopping since she was 13 and is apparently single. "Log Roller" huh? If she is blind and owns a liquor store...I'M IN!! Hmmm...Gretchen is 18, and you, Mr. Fed Duck, are how old??? I hope you are not a cradle robber, sir. BTW I would be "Best Supporting ACTOR....and homophobe......"
If you're looking for all of those things in one woman, whether or not this one even counts, I'm afriad you are picky. As an aside, isn't 'log roller' an innuendo for 'innuendo'? MC - you've misunderstood. Fed is quite willing to accept one of each. Any blogettes who are (pick one or more) Young, Single, Hot, Athletic, Intelligent, Self-Suficient, and a Logroller can apply directly to Fed. He may also accept male bloggers but ask him yourselves. Fed also failed to mention the other advantage of this particular hot blonde... If he end up married to her, there will be no mother-in-law problems. Gawd... you guys are sick-oes! I am geezering around at the ripe old age of 26. Granted, there's an 8 year gap, but she's quite mature for her age, and I'm a Dave Barry blogger, which makes me pretty immature by default. Also, she might appreciate a wizened world traveler who could offer her so much knowledge and experience. If, however, she appreciates knock-knock jokes and pizza, we'd be great together. The court finds the defendant, Mr. Federal Duck, to be perfectly within his obligatory rights to ogle young women, and orders the immediate removal of the plaintif's Rottweiler from the defendant's bum. Well, OK. The dog has been confined to the kitchen. However, as the mother of two wonderfully adorable daughters, I reserve the right to keep my shotgun cleaned and polished. And honestly, you sound alot older than 26. Take that as a compliment. Hey, you dumb mutt! Get out of the doughnuts! Thank you! I take that as a great compliment. I just graduated from college a few years ago (I was on the slacker-writer-journalist 5.5 year plan, where you change majors like you change socks). I'm still basically in college mode, with the ogling and whatnot, now I just have to wear a tie. Nothing funny has happened in Topeka for years? Fred Phelps is not funny - ha ha. Fred Phelps is funny - strange. hello, spent most of the day out of town yesterday, but thank you all for the birthday wishes and thank you cyn for the lovely card. and bo, i'm 20. but most of the time i'm about as mature as a 13-year-old, so close enough. may the force be with you all too! It's none a good news to know that a beach is full of bacteria. Where are the coastguards? Please do something, we can not accept something like that. It's not a safe area to have a vacation.